I couldn’t even apply to a job without feeling a strong wave of fear and resistance. The thought of working 40+ hours again doing therapy felt completely overwhelming. I knew something was wrong, and I couldn’t keep doing what I had done in grad school. I was burnt out. Big time. I had pushed myself mentally and emotionally through the classes, internships, required hours, supervision, licensing tests, and dissertation process only to realize I had pushed myself too hard. I didn’t get the adequate support I needed, I didn’t have the self-care skills, and I knew something had to change. Some time off was in order, and then I needed to focus on myself, my needs, my mental and physical health, and start the process of healing from burnout. Week after week of yoga classes, meditation groups, therapy, and improving my diet started to pay off. I started feeling better, more ambitious. But I knew I couldn’t go back to work for someone else. I needed to sit down and ask: What do I really need in a work environment to sustainably help others? What hours, commute, colleagues, and support did I need to feel happy and fulfilled in work? For me, the answer was to start my own practice. I set down the path to creating the work-life that I wanted and my body/mind/soul needed. And I continued to prioritize self-care, self-love, and self-compassion. I knew that if I was not well mentally or emotionally, my clients would not get there either. So with time and intention, my burnout started to ease up. I felt more engaged and looked forward to doing the work every week. After years, now I feel I am in a good place. I am still on the healing journey (perhaps it never ends), but my experience with burnout taught me a lot. I want to share with you what I have learned on this healing journey from feeling Burnt Out to Healthy and Fulfilled with work. If you are a helping professional and feeling burnt out, it’s time to slow down and reevaluate. By healing yourself, you really do make a big difference in the lives of the people you help. 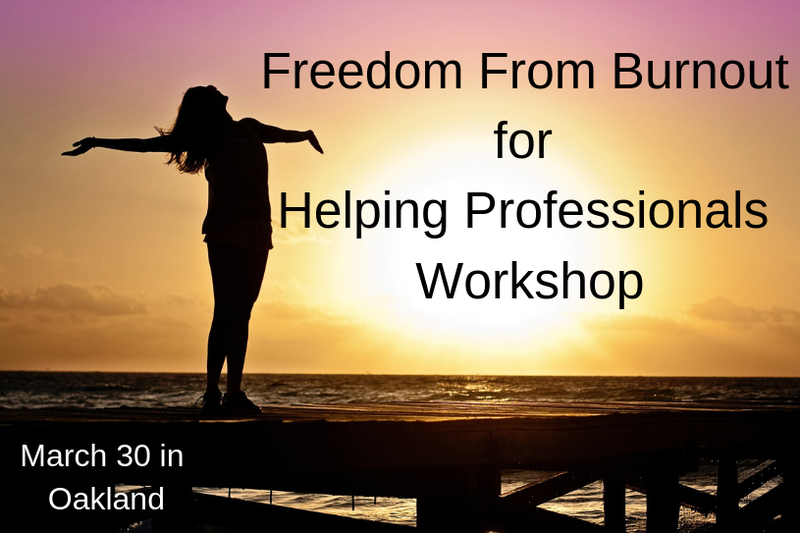 On March 30 I will be leading a small workshop in Oakland called Freedom From Burnout. Click below to join me, and I hope to see you there!